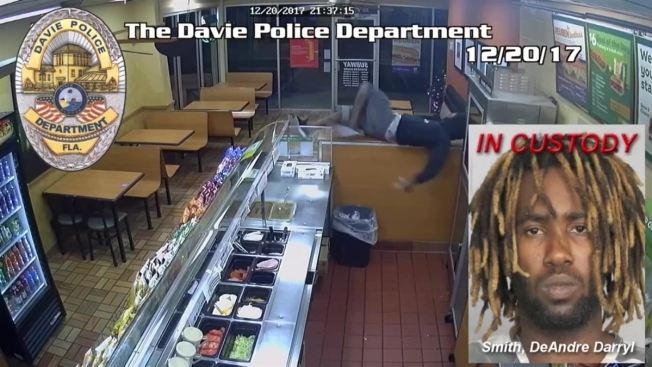 Davie Police say they have discovered who committed two armed robberies within minutes of each other last month – someone who was already behind bars. Officers say that DeAndre Smith confessed to the crimes from December 20th, first at a Dunkin Donuts off State Road 7 and a Subway restaurant located at 6775 Stirling Road. Surveillance video at both locations captured the crimes on tape. An investigation found that the vehicle involved in both crimes was taken during an armed carjacking in Fort Lauderdale and had Smith’s fingerprints on it. Smith, who was already in custody for a separate crime, was interviewed by detectives and confessed to both robberies and the carjacking. Police have not said what he was already in jail for or how many additional charges he will now face.